The Omni Grove Park Inn has been chosen as the venue for the 18th International Conference on the Recovery of Biological Products. 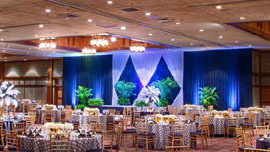 The spacious meeting rooms and spectacular outdoor settings offer a new and unique location for a Recovery Conference. Located in Asheville, North Carolina, which was recently named the "#1 Best in the U.S. Travel 2017 Destination" by Lonely Planet, the historic Omni Grove Park Inn lies on the western-facing slope of Sunset Mountain within the Blue Ridge Mountain Range. Listed on the National Register of Historic Places, the hotel is an exceptional example of the Arts and Crafts Style, housing one of the World’s most extensive collections of Stickley Furnishings. 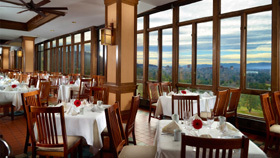 The Grove Park Inn therefore welcomes conference delegates with a tradition of southern hospitality, rich heritage and all the conveniences a modern traveler requires, including an award-winning subterranean spa, a Donald Ross designed golf course and four locally sourced restaurants. A vast array of art galleries, local craft breweries and fun activities are available in the mountains of Asheville, North Carolina. The main Conference Ballroom will provide all attendees with an outstanding Oral Session meeting space, complete with state-of-the-art AV facilities. The adjacent Poster Session Ballroom and Reception Hall will be open throughout the Conference, with dedicated times allocated for poster viewing and interaction with poster presenters. For further information on the Venue, go here!